AutoHook specializes in proving sales attribution combined with their untouched ability to increase showroom and service drive traffic. Through their 100% DAS-Eligible incentive solutions, AutoHook supplies true, incremental sales, new to brand buyers, and service appointments to KIA Dealers. Powered by Urban Science, AutoHook proves ROI with the fastest, most accurate sales and service data in existence. 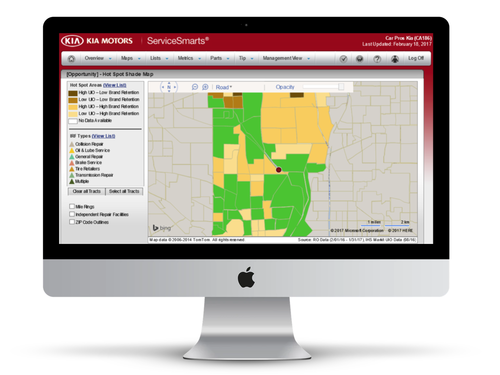 ServiceSmarts® is an online tool that allows all KIA Dealers to identify and target their best Service opportunities. What Happens When Two Superpowers Combine? After establishing a proven track record for driving sales and new to brand buyers to KIA stores, it was only a matter of time before AutoHook brought our high-converting incentive solutions to the service drive! With the all-new AutoHook + ServiceSmarts integration, KIA dealers can improve the effectiveness of every service campaign and TAKE BACK service revenue by isolating, targeting, and incentivizing the customers with the highest level of opportunity. ServiceSmarts data identifies any potential missed opportunities and AutoHook incentives allow you to create campaigns to convert those opportunities into service appointments. Target inactive or at-risk customers using your ServiceSmarts data. Identify and incentivize your greatest areas of service revenue opportunity. Deploy AutoHook's custom email incentive campaigns to secure more service appointments without compromising your price integrity. STEP 1: Service Manager selects a target audience within the ServiceSmarts tool (active customers, inactive customers, first service appointment, or at risk service customers). STEP 2: After selecting a list of customers to target, select AutoHook as your Fulfillment Vendor. This will enable you to create targeted service campaigns using strategic email incentives offers. The email creative has already been done for you. STEP 3: Select your campaign details including the name of your campaign, duration, email template, the dollar amount of incentives you'd like to offer, etc. Don’t forget to click to preview your service URL to make sure your customers can schedule an appointment online. 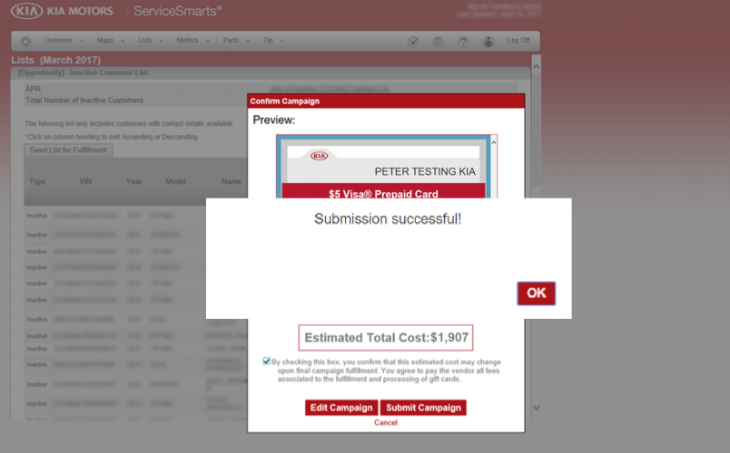 STEP 4: Preview and confirm your campaign and hit submit. STEP 5: Customers visit your service department to redeem their incentive. A Service Advisor activates the customer's incentive using a unique 9 digit coupon code and AutoHook's easy 30-second redemption process. The customer instantly receives their Visa e-gift card while their vehicle is being serviced. SIGNING UP IS 100% FREE. YOU ONLY PAY IF A CUSTOMER SHOWS UP IN YOUR SERVICE DRIVE TO REDEEM THEIR EMAIL INCENTIVE. SIGN UP NOW TO START TAKING ADVANTAGE OF THIS PROGRAM! *CAUTION: Dealers using AutoHook Incentives have been known to experience outrageously high levels of ROI. Here are 10 different ways to use AutoHook incentive offers to boost your service campaigns. A July 2016 client survey revealed some interesting insights from AutoHook’s dealer and OEM subscribers. The study’s strongest finding confirmed: What AutoHook customers want, AutoHook customers get.